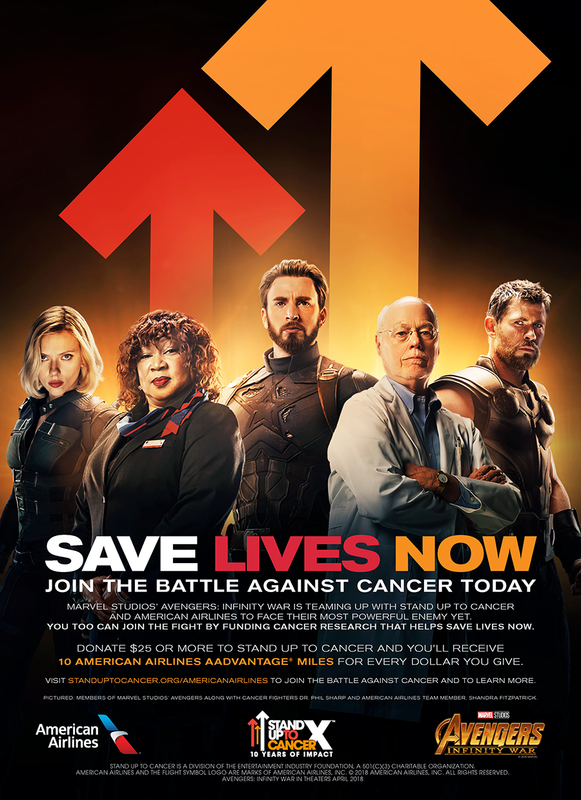 Newsroom - Stand Up To Cancer, American Airlines & Marvel Studios’ Avengers: Infinity War Join Together in the Battle Against Cancer - American Airlines Group, Inc.
New PSA features Marvel Studios heroes, American Airlines team members and SU2C researchers joining forces against the disease. LOS ANGELES — Today, Stand Up To Cancer (SU2C), American Airlines and Marvel Studios’ Avengers: Infinity War announced a powerful collaboration as they team up in the fight against cancer. The inspiring initiative and public service announcement (PSA) features beloved Marvel Studios’ Avengers: Infinity War heroes, esteemed SU2C researchers and American Airlines team members who have personally fought cancer. To raise funds, awareness and further Stand Up To Cancer’s mission to bring groundbreaking therapies and treatments to patients as quickly as possible, this first-of-its-kind collaboration comes to life in print, radio, digital and broadcast PSAs with a powerful call-to-action and additional campaign elements to come. The print PSA includes Marvel Studios’ Avengers: Infinity War cast members Scarlett Johansson as Black Widow, Chris Hemsworth as Thor and Chris Evans as Captain America, standing alongside SU2C Scientific Advisor Dr. Phillip A. Sharp and American Airlines LAX-based Customer Service agent team member and three-time breast cancer survivor, Shandra Fitzpatrick. The broadcast PSA will feature footage from Marvel Studios’ Avengers: Infinity War, and of SU2C’s Scientific Advisor Dr. Lee J. Helman, as well as Shandra. Mark Ruffalo, Chris Hemsworth, Paul Bettany, Scarlett Johansson, Chris Evans and Chadwick Boseman are featured in the voice-over portion of the broadcast piece. The PSA campaign not only raises awareness for the cause, but also encourages American Airlines AAdvantage® members to donate to Stand Up To Cancer. For every dollar donated, American Airlines AAdvantage® members will receive 10 American Airlines AAdvantage® miles with a minimum $25 donation. Learn more at StandUpToCancer.org/AmericanAirlines. In addition to American Airlines’ Shandra Fitzpatrick,the PSA campaign includes LAX-based Aviation Maintenance Technician Anthony MacGilfrey; LAX-based Flight Attendant Michelle Ballard; Miami-based Fleet Service Crew Chief Juan Barquero; Chicago-based Captain Ron France; and DFW-based, Customer Care Manager Lynnae Stripling. Please visit StandUpToCancer.org/AmericanAirlines to learn more about the campaign, and follow us on @SU2C across Facebook, Instagram, and Twitter for the latest updates. Donate $25 or more to Stand Up To Cancer and receive 10 American Airlines AAdvantage® miles for every dollar you give.